first off, there are still openings in the falkland fiber club if you’re interested. they’ll stay up until April 10th and if you’ve never spun with falkland, i can’t recommend it enough. for a while, i had to keep casting things on because i had nothing brainless on my needles. this was especially important when i was sick. so, after that i’ve some finished projects for you. colinette jitterbug and size 2.5 or 3 needles, don’t remember which. 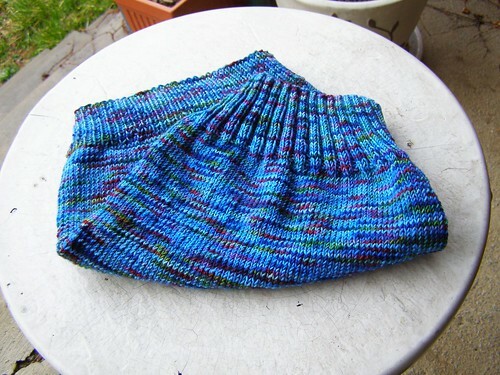 this yarn was actually a sock and a half, which i frogged and used for this instead. those socks were knit quite a while ago, and somehow i doubt the momentum still existed to finish them. the pattern is here. since i’m having a june baby, i’m not making more than one of this weight, although i may make a worsted weight one for later on. a tiny tiny baby hat for the ride home from the midwife center. again, the june baby thing strikes. the color is not so good here, but you get the idea. i predict that this hat will be worn once. yup. and i’m considering a tiny little wrap sweater to be worn once also, using the rest of this hand dyed recycled sweater wool/angora and some white from the same sweater. we’ll see. using ysolda’s mods originally seen here. when julia passed this yarn (noro silk garden lite) on to me when she moved away and i already knew i wanted to make this with it, it just took a while to get around to it. 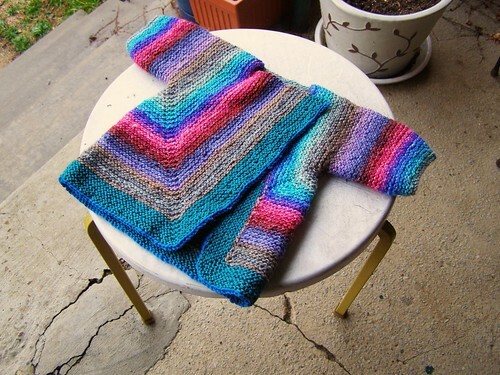 i love love love the asymmetry and the long repeats of color. seriously. love it. now to just find some buttons and decide whether to gift it or keep it. no hurry on that one though, since the next friends up for having babies are having summer babies also! 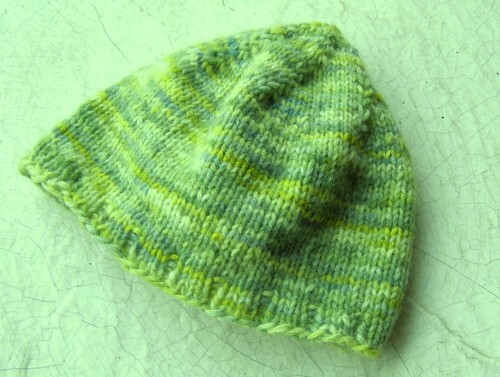 This entry was posted in baby, cosyknitsliterally, hats, knitting, sweaters by cosymakes. Bookmark the permalink. The baby jacket is beyond adorable! Love it. Love the asymmetrical BSJ! What a great idea! And beautiful yarn! i guess you’d recommend i not make the sweater then :) we’ll wait and see if this one ever gets worn.